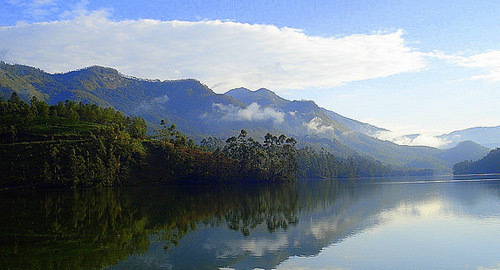 Munnar is the famous Honeymoon Destination in India. Munnar is a pleasing hill station at an altitude of 1520 m in Kerala. Have a dream Honeymoon in Munnar where your eyes will be flooded with absolute greenery, where you can smell the sweet fragrance coming from the tea gardens, where you can climb the highest peak of Kerala, Anaimudi and where you will find the rare Neelakurunji flower that blooms once in 12 years and the next flowering time is in 2018. Let the landscaped sceneries, pristine beauty, fresh breeze and colonial aura enter into your spirits on Honeymoon in Munnar. Enjoy visiting Attukal, Chithirapuram, Devikulam, Echo Point, Eravikulam National Park, Kundala, Lock Heart Gap, Mattupetty, Nayamkad, Pallivasal, Pothamedu, Powerhouse Waterfalls, Rajamala Wildlife Sanctuary and Munnar Tea and Coffee Plantations.Honeymoon in Munnar Indulge in the pleasure of the Honeymoon in Munnar with sightseeing tours to nearby areas including Anayirakal, Cheeyappara, Chinnar Wildlife Sanctuary, Kalvari Mount, Malankara Reservoir, Marayoor, Meenuli, Nadukani, Ramakalmedu, Thommankuthu, Top Station and Valara Waterfall. Continue your Honeymoon in Munnar with some adventurous sports. Try catching a fish, rowing a boat, taking a trek route to the top of the hill, cycling around the town and trying your hands in paragliding. With so many tea estates around you, what better thing can there be than to buy tea on your Honeymoon in Munnar?